China Glaze Nail Polish, Polar Ice, 828, .50 fl. oz. 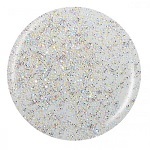 Light silvery blue and opalescent multi-colored glitter in a clear base.